PRESS RELEASE: Line 6, the industry leader in digital modeling technology for music-creation products, announced today three free updates that deliver a host of effect models and a computer-based editor-librarian to Spider IV and Spider Valve MkII guitar amplifiers: Spider IV Edit, Spider Valve MkII Edit, and Spider FX Infusion software. "Spider amplifiers are famous for their unparalleled flexibility," remarked Aaron Suplizio, Amplifier Category Manager at Line 6. "These free updates, which deliver additional effects and expanded flexibility, are the icing on the cake." Spider FX Infusion delivers 28 additional effects to Spider IV and Spider Valve MkII amplifiers. The free update more than doubles the amount of overdrives, compressors, delays, reverbs, mods, and wahs included each amplifier, and boosts the total to more than 50 effects: a number that tops the amount offered by any other modeling amplifier. 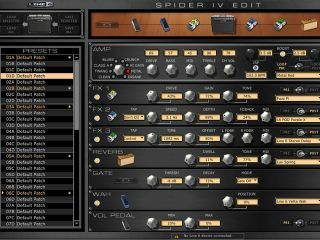 Spider IV Edit and Spider Valve MkII Edit provide computer-based editor-librarian functionality to Spider IV and Spider Valve MkII guitar amplifiers. Users can edit their presets, create backups, and share tones via email with other Spider amplifier users. Spider presets can also be traded freely at CustomTone.com, a popular Line 6 website used for the trading and rating of Line 6 presets. A Line 6 FBV MkII foot controller is required to download and use Spider IV Edit, Spider Valve MkII Edit, and Spider FX Infusion software. Spider IV Edit and Spider FX Infusion software for Spider IV amplifiers will be available for download from www.line6.com/software as of January 26, 2010. Spider Valve MkII Edit and Spider FX Infusion software for Spider Valve MkII amplifiers will be available for download from www.line6.com/software as of February 9, 2010. Spider IV 15 and 30 are not compatible with the updates.